Humans have lived in Australia for a very long time. Some scholars claim that it might be as much as 70,000 years, but most say that their arrival was about 40,000 to 50,000 years ago. Australia is a big place and it is estimated that these indigenous people may have numbered 350,000 at the time that Europeans first discovered the Australian continent in the early seventeenth century. A few scholars believe that the Chinese (15th century) or the Portuguese (16th century) or even the Spanish (a few weeks before the Dutch) may have beaten the Dutch to Australia, but the first recorded discovery was by Willem Janszoon in 1606. Janszoon was sailing out of Batavia for the Dutch East India Company. His report on what he found did not lead to any interest in following up on his discoveries until Lieutenant James Cook came along in 1770. Cook landed at Botany Bay just south of what is today the city of Sydney and claimed what he called New South Wales for England. Cook's report together with the recommendations of Sir Joseph Banks, his naturalist on board, combined with political developments in North America and in England, convinced the British government that they should establish a colony in Australia. Prior to losing the American colonies to independence, the British government had been sending about a thousand convicts a year to America. Prison conditions in the British Isles at the end of the eighteenth century were terrible and were provoking a lot of domestic controversy and political discord. Humanitarians believed that "transportation" was more humane than eighteenth century goal life in England. In addition, the British hoped that Australia would be a useful source of the raw materials needed by a maritime power, particularly timber and flax. On January 1788, Captain Arthur Phillip commanding a fleet of eleven ships with 1,332 people on board sailed into Botany Bay only to find that there was insufficient fresh water to sustain a settlement. On January 28 he moved to a body of water that Cook had named Port Jackson and landed at a spot that he named Sydney Cove after the British Home Secretary, Thomas Townshend, Lord Sydney. Phillip remained in Sydney as the Governor of the Colony of New South Wales and directed the establishment of what was in essence a convict colony. 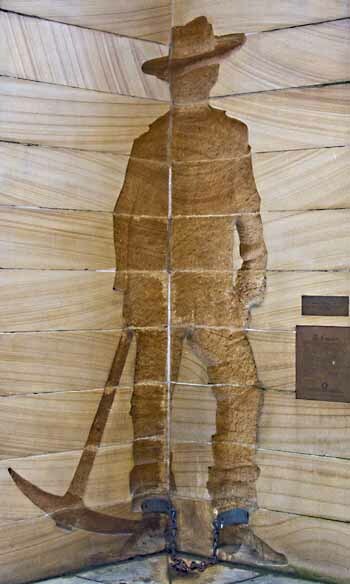 Their first chore was to establish themselves in what they called "The Rocks" above Sydney Cove. It was backbreaking work that literally included cutting a place to live out of solid rock. During the next eighty years, other parts of Australia were settled and another 161,700 criminals were transported to Australia. There was a small trickle of free immigration as well, but there is no question but that the early pioneers were mostly convicts, some of whom, after 1801, were released as free men and women after having served their sentences. In the beginning of the nineteenth century, things began to change and by the 1820s free men and women began arriving in greater numbers. In 1868 transportation was completely discontinued.